Gil Gonzales, a former football/baseball player for the University of Arizona, has been recognized as being a superior role model exhibited by his dedicated and untiring efforts on behalf of Tucson youth. 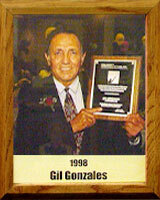 Also a former amateur football/baseball player, coach and official, Gil has been cited by former Mayor George Miller and the City of Tucson for his continued support of the Hispanic Sports and Academic Enrichment Program and his selfless commitment, devotion and leadership on behalf of today’s outstanding youth. Among Gil’s contributions to sports in Pima County is his involvement with Little League and handball on a state and national level. He also has been directly involved in fund-raising for YMCA, youth baseball parks, recreation centers and the Arizona Families for Children agency.